These instructions explain the process I used to record myself singing for "audition" purposes within my choir, Thames Valley Chorus. I play the backing track through the Laptop's loudspeakers, and use the microphone in the webcam for recording my part, and to pick up the backing track. You may need to work out how to pan left and right on audio playback so you can eliminate your own part from the backing track. If it's easier to operate, you could play the backing track though a Hifi instead. To record music (or any sounds) onto your PC, you will need some software. I use a software package called "Audacity", which is free and open-source. 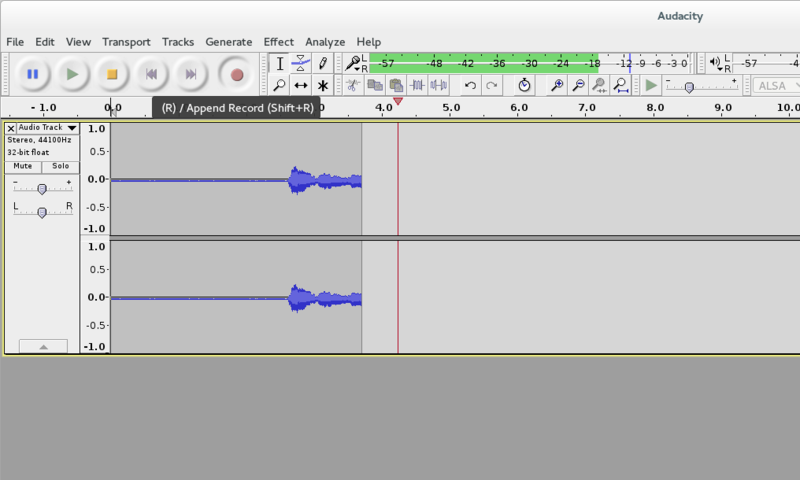 For legal reasons, Audacity does not include the MP3 encoder (see why), but it can use another piece of software called the "LAME encoder". Follow the instructions from UWEC to download LAME and configure Audacity to use it. Spend some time getting the recording levels right (and warming up your vocal chords! ); the backing track needs to be audible, but not drowning your own voice. To throw away the recording, click the little cross at the top of the Track Control Panel. To save, choose "File", then "Export as MP3..."
Audacity can only read files in WAV or AIFF format - it can't read MP3 or M4A files. I found this out when I wanted to edit an iPhone recording. GNOME 3 Audio controls: Press Super (Super is usually the key with the Windows logo), and type "sound". You want the tool that can "change sound levels, inputs outputs and alert sounds".